Tsk… I know, I know. I’m few days late in posting this up. Anyone watched last Sunday’s Australian Open Men’s Singles final? I am still shaken with the fact that I get to witnessed this historic tennis match with such great proportions. 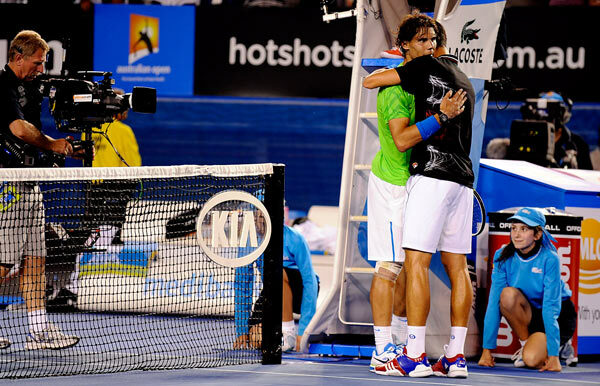 First off, Congrats Rafa! You did it!!! What a game man! I came into this game feeling 50-50. Knowing the improving Roger would love to equal Pete Sampras 14 GSs and knowing we can’t write off the Spanish Matador, Rafa easily. As a result, we witnessed another one of the greatest tennis played by both champions. Beautiful tennis. Excelente!!! I went WOW after WOW from the first setter. Impressed with shots impossible to others but not to this two men. The epic match ended in 4 hours 23 minutes in 5 sets. Yup I was there again at Stadium Malawati – yesterday, this time for the Clash of Times match between Roger Federer and Pete Sampras. I came in late and the match has just started. The stadium is packed. I would say about 95% occupied. Wohooo! At last I’ve seen Rafael Nadal and Richard Gasquet live in person although they look very small to me. Yes I was there. 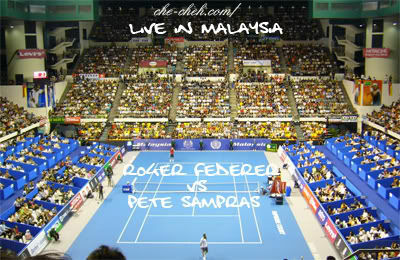 I was at Malawati Stadium, Malaysia yesterday night for Rafael Nadal vs Richard Gasquet clash.